EntryPoint Dealerships franchise business opportunity. Free EntryPoint Dealerships business franchise information. Offer homeowners an exciting, affordable, and very unique way to add value and curb-appeal to their homes, and add natural light into their homes! 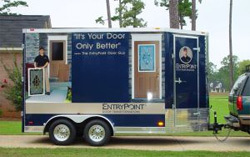 EntryPoint offers homeowners a safe and secure way to change the look of their home: An EntryPoint installer removes the homeowner’s existing door, takes it to the <?xml:namespace prefix = st1 ns = "urn:schemas-microsoft-com:office:smarttags" />Mobile workshop, cuts a hole in the door, and installs a safe, secure, and beautiful decorative glass panel that the homeowner has chosen. The installer then reinstalls the door. The entire process takes about an hour and the homeowner is left with a beautiful custom door which changes the appearance of their home. EntryPoint franchisees do not have to have previous industry experience and you can hire employees to do the actual installation work. Interest in home improvement has never been higher! People are enjoying their home more, and spending more time and money on and in them. 75% of today’s homes are built with steel or fiberglass doors and 73 million doors have been delivered over the past ten years with no glass or clear glass installed. Therefore, the market for EntryPoint’s services is massive and growing steadily. Virtually every homeowner in any area of the country can benefit from the services of EntryPoint. Now is a great time to join us! No industry or business ownership experience is necessary to become an EntryPoint franchisee. We will provide you with all the tools, training, and support you need to start your business. You must have demonstrated organizational and sales and marketing skills, as well as be a self-starter and have management capabilities. We’ll provide you with everything else you need. To learn more about the EntryPoint Dealerships franchise opportunity, simply complete the form below.